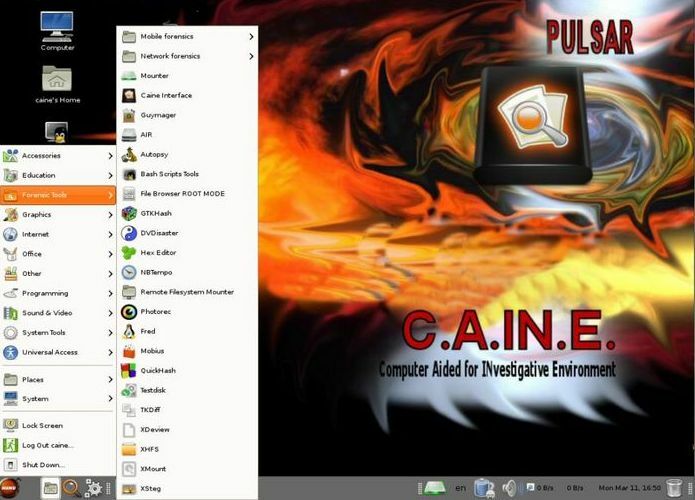 Available release CAINE 4.0 (Computer Aided INvestigative Environment), Live-specialized distribution designed for forensic analysis, finding hidden and deleted data on disks and detect residual information to restore paintings break the system. The distribution is based on Ubuntu Linux and is equipped with a single GUI-based shell MATE (fork of GNOME 2) to manage a set of versatile tools for the study of both Unix, and Windows systems. Size of the boot image iso-1.7 GB. The structure includes tools such as GtkHash, Air, SSdeep, HDSentinel (Hard Disk Sentinel), Bulk Extractor, Fiwalk, ByteInvestigator, Automated Image & Restore (AIR), Autopsy, Foremost, Scalpel, Sleuthkit, Guymager, DC3DD. We should also mention specifically designed as part of the system for a thorough analysis WinTaylor Windows-systems and generate detailed reports of all reported anomalies. The structure also includes a selection of supplied scripts for file manager Caja (a fork of Nautilus), which allow to perform a wide range of checks disk partition or directory and see a list of deleted files and analyze structured content, such as the history of the browser visits, the registry Windows, image metadata EXIF. Compared to the last issue of the size of the boot image increased to 500 MB, which is due to the inclusion of the LibreOffice 4.0.1, Sqliteman, Remote Filesystem Mounter, sdparm, netdiscover. The distribution is also integrated two utilities own design: RBFstab to write to / etc / fstab to mount the elements studied devices in read-only mode and Mounter – applet to mount devices.